There’s something a little obscene about splashing out on an expensive meal in Bangkok when good, cheap food is so readily available everywhere. From those fantastic portable street stalls hawking meat lollies, to the hole-in-the-wall vendors dishing out soups and stir fries, you can always find a satisfying meal for less than you’d spend on a coffee and a pastry back home. Of course, day-to-day, I very much appreciate a noodle soup or fried pork for my lunch, thank you very much. But what if I could swank it up at a posh restaurant – ranked 7th in Asia and 22nd in the world – munch down a 6-course set menu and STILL have change from £40 / $50…? 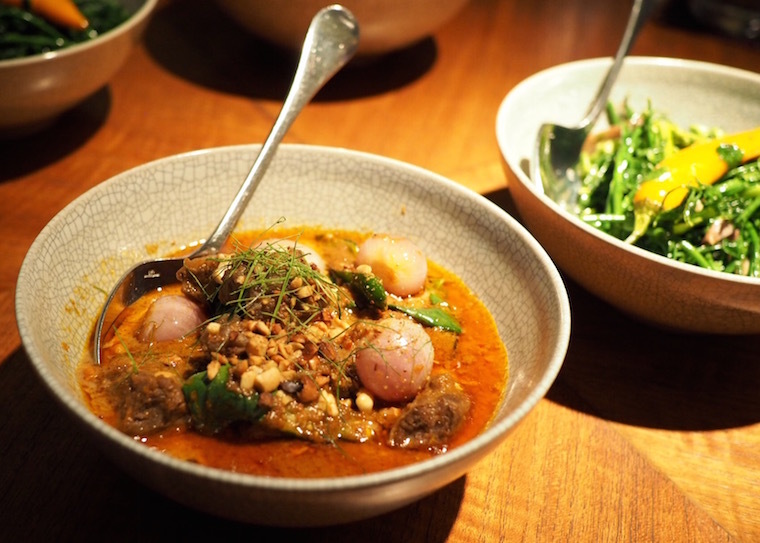 Enter: Nahm – the highly acclaimed restaurant headed by Aussie chef David Thompson. The first dish – a complimentary appetiser – was actually one of my favourites. The sticky paste of pork, chicken and prawns reminded me of the sweet mincemeat you find in Christmas mince pies in the UK, but with a slightly more garlicky kick. And while you’re chewing through it all you get that sugary acidity from the pineapple cutting through everything, blasting out sweet sourness that makes your lips pucker. I’m definitely trying out that pineapple / mincemeat combination when we go home in December! Two more canapés followed, this time from the set menu. You don’t get any choice in these, which is probably for best as I’m awful at making decisions. 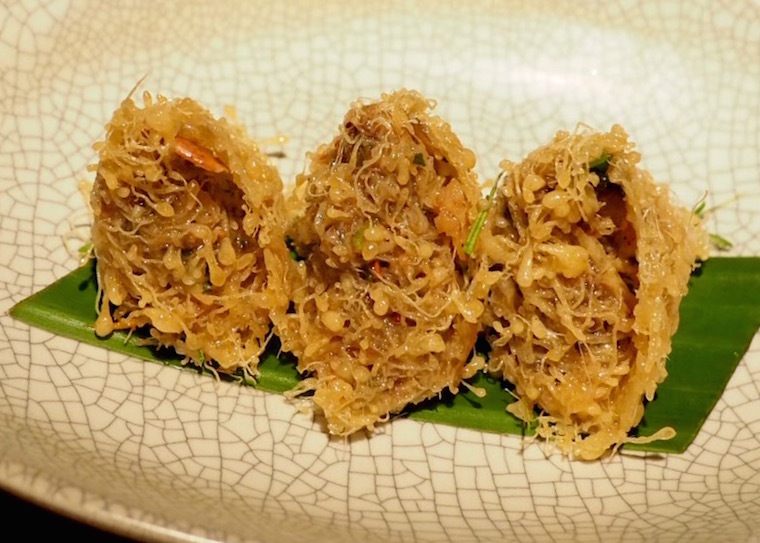 Those crispy looking things above are the egg nets with prawns, wild almonds and kaffir lime. It was surprisingly soft, and a little too heavy on the kaffir accent for me – the rest of the flavours got a bit lost. 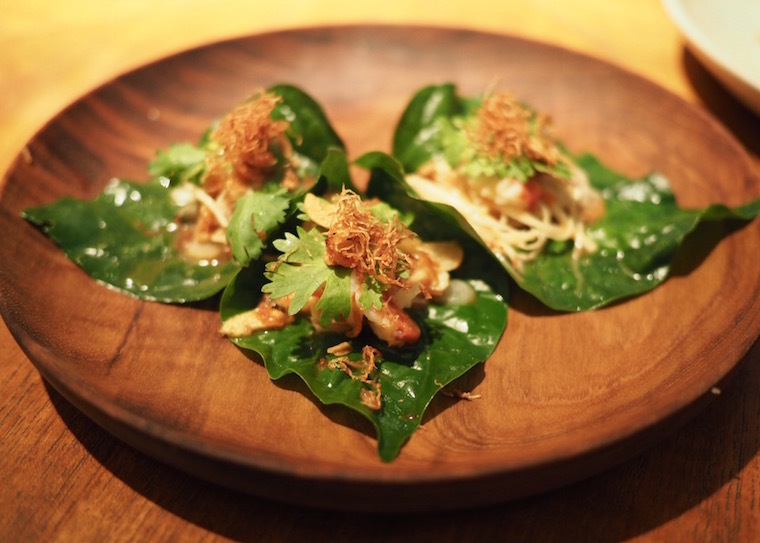 Next out was pork and lobster with shredded ginger and Thai citron, served on a betel leaf. I liked the lack of elegance involved in folding up the leaf and shovelling everything into your mouth – all six of us at the table looked distinctly chipmunk-like while trying this one – but it tasted so much more robust and flavourful than the egg nets, and the meat concoction really held its own against the rough earthiness of the betel leaf. It was time to make a decision: hot and sour soup with prawns and mushrooms, or roast duck soup with Thai basil and young coconut? I usually find that hot and sour soups are far too citrusy for my palate, but I absolutely HATE the aniseed taste of Thai basil… so it’s weird that I chose the duck. But luckily, the risk paid off. 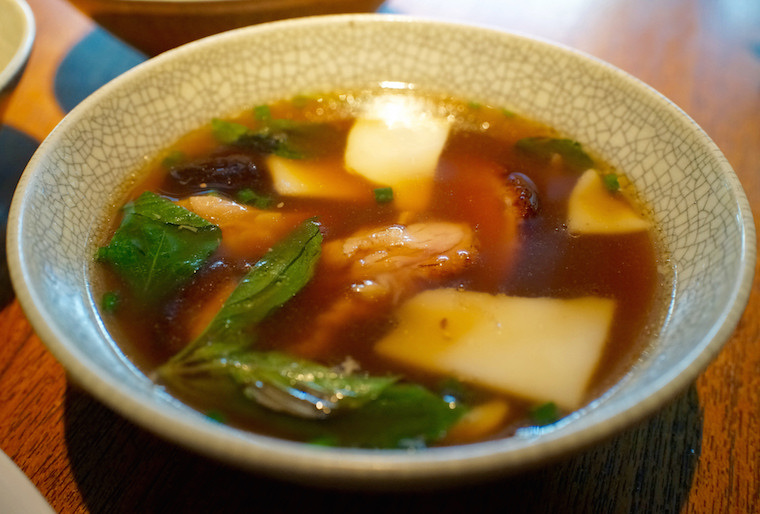 The Thai basil was no more than a subtle hint in the background, while the rich broth and chunks of tender duck – complete with slightly rubbery skin – packed a really meaty punch with every single mouthful. Such great comfort food. And now for my favourite dish of all, possibly ever. In fact, I’m sad I can’t work out how to broadcast a little fanfare when you get to this part, so you’ll just have to imagine it. Oh my goodness. All I can say about this dish is: Woof. Our table chose a simple veggie stir-fry of pak wan, garlic and mushrooms for this course, and I’m so glad we did because, a) veggies are good for you, and b) it helped the occasion feel more like a meal and less like a free-for-all. It’s almost comforting to have something so simple – done incredibly well – next to all those fancy dishes. That said, if we went again I think I’d go for something a little more adventurous. 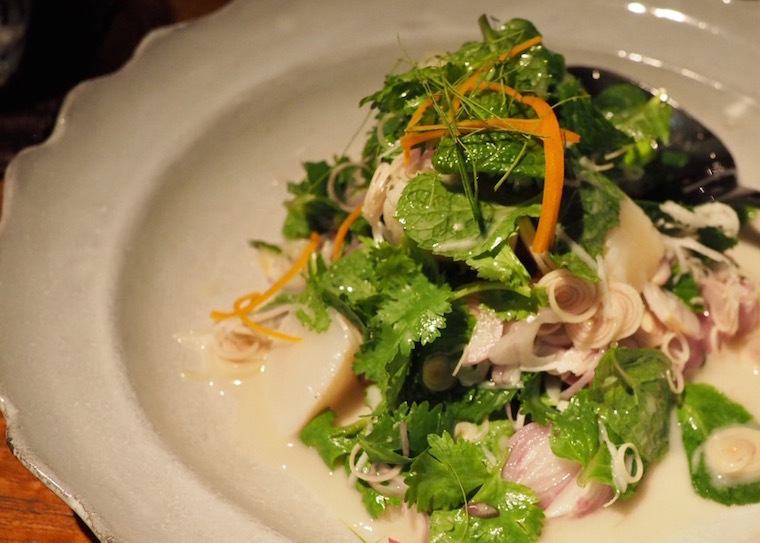 Maybe the steamed coral trout with Bang Rak yellow beans and pickled garlic? Or perhaps the stir-fried cured pork with tomato and fiddlehead ferns. The only other option was a grilled omelette – but who orders omelette? This scallop salad with coconut and lemongrass was probably amazing, but by the time I got around to it I was too stuffed to do it justice. I blame the curry. And the other three courses before that. 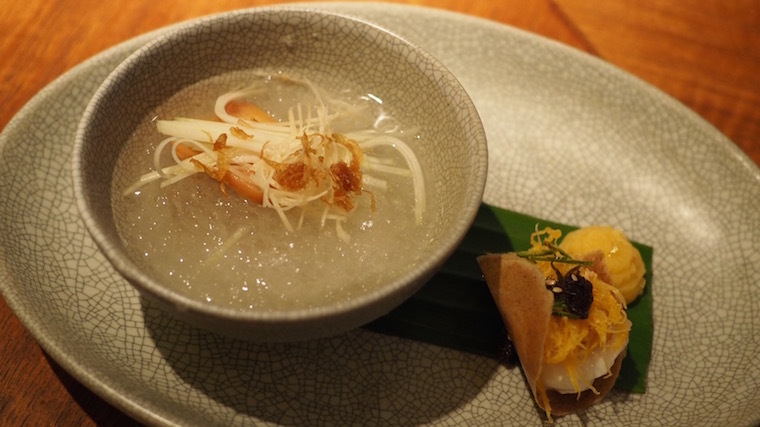 I did manage to squeeze in a scallop just to say I’d tried it, and can attest that it was cooked to perfection – it melted in the mouth and clung nicely to the coconutty dressing and the zing of lemongrass. 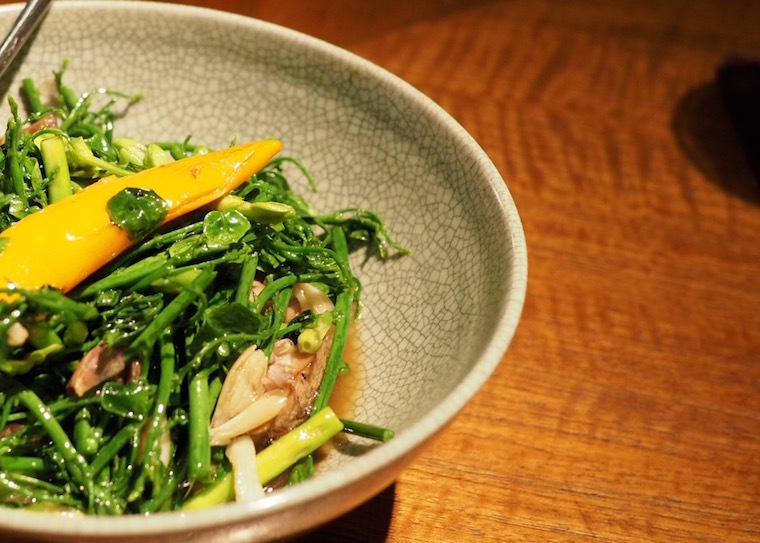 I’m not a fan of lemongrass – the taste reminds me of washing up liquid – but it didn’t overpower here, at least not with the tiny bite I tried. And now for my least favourite dish. I know, I know – how can dessert ever be bad? But honestly, that bowl of icy weirdness literally left a bad taste in my mouth. It came in two parts – the morsel to the right was actually quite delicious: a sweet Thai wafer with poached persimmon and golden duck egg noodles. The mirroring of the one-bite canapés we started with felt like a nice way to bring the meal full circle, and the wafer just dissolved in the mouth leaving the fruity, creamy contents. The bowl of icy sweet and salty syrup next to it should have been the perfect palate cleanser to end the meal… if it hadn’t been for the fried shallots that infused the whole dish with a jarring onion flavour. That’s shallots. Fried. In my dessert. It kind of took the shine off the rest of the meal. The closest public transport stop is the Lumphini station on the MRT, but you can also grab a taxi or go by Uber if you’re travelling from across the city. Traffic can be a nightmare, though – we spent at least half an hour at a standstill heading back to Sukhumvit. A 10% service charge is automatically added to your table’s bill. I would highly recommend booking in advance via phone, email or via the website. 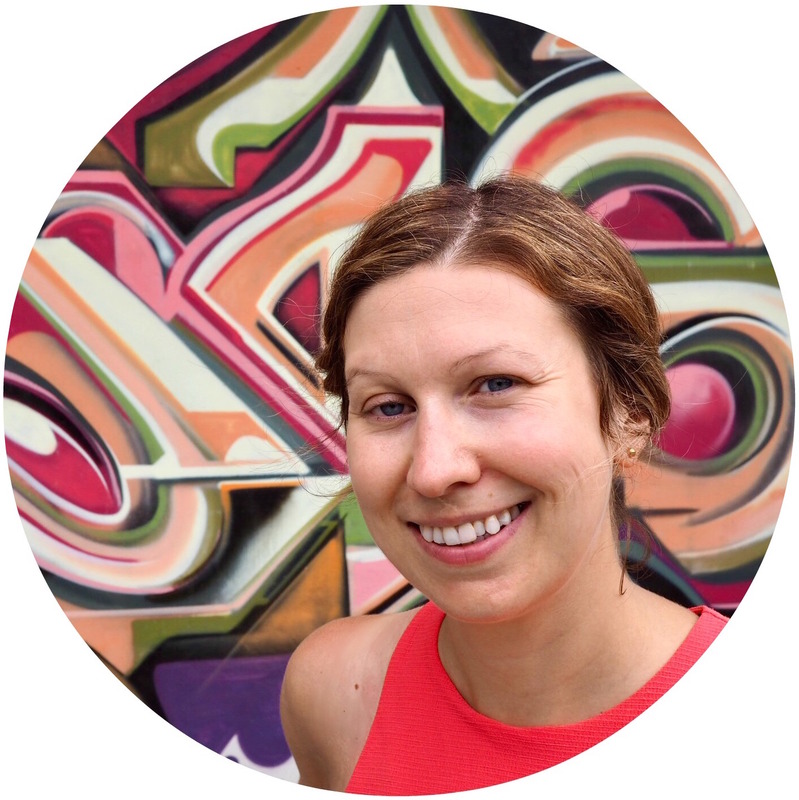 The website process is a little clunky, but it does the trick. A note on spiciness: Past reviewers have commented on the insane levels of spiciness in certain dishes – Christine from Almost Fearless actually had to ask for a glass of milk – but I think the restaurant has taken note because none of the dishes we tried were overly hot. In fact, I was a little disappointed not to have my face melted. If you’re into ‘Thai spicy’, be sure to tell the wait staff when you order (and wave a fond farewell goodbye to your taste buds). Ok that’s it – are you hungry yet? Which stir-fry dish would you have gone for? 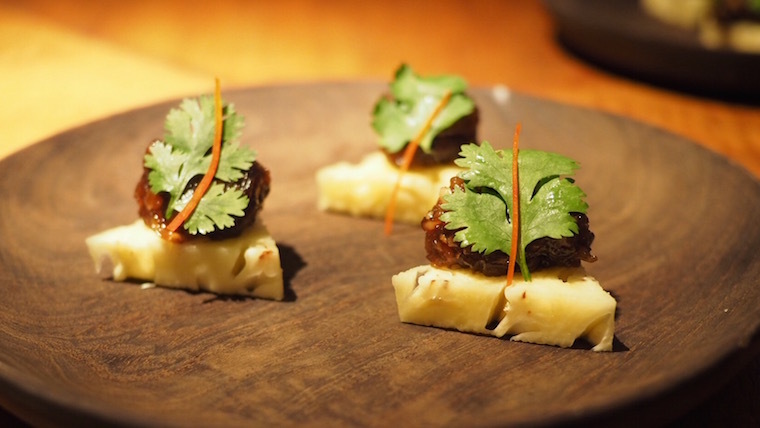 Nahm is recognized as one of the top restaurants in Bangkok, and deservedly so. It s been a few years since I last visited, and the restaurant while excellent before has improved significantly.